While some people see Veterans Day as just another day of the year, Coli Burke and Amanda Jonas understand what it really is: a day to honor all of our amazing military veterans for their service and dedication. Coli, a military wife, and Amanda, the granddaughter of a veteran, are very passionate about giving back to our vets. They’re also passionate about everything hair related—Amanda and Coli are both independent hairstylists who work at Ravin’ Manes on Mall Drive. This, tied in with their gratitude for our vets, is what inspired them to start Hairica. What is Hairica, you ask? Hairica (Hair for America) is an annual hair show and fundraiser aimed at raising money for Disabled American Vets (DAV) Chippewa Chapter 21. This year’s theme is Hairica: Unlit, which means avant-garde and NY Fashion Week-esque hairstyles! 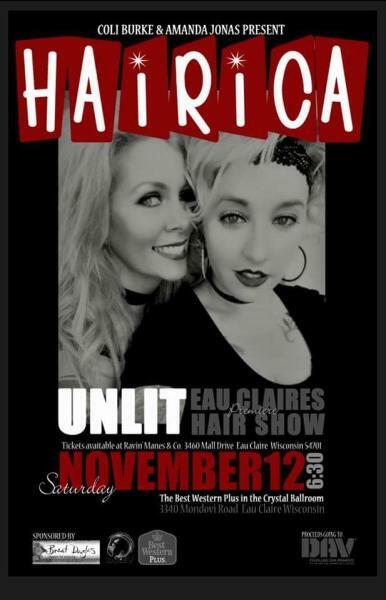 Hairica will take place on Saturday, November 12 (over Veteran’s Day Weekend) from 5pm-1am at the Best Western Plus Eau Claire Conference Center’s Crystal Ballroom. In addition to the hair show, guests can expect gourmet food (deets on that below), drinks, raffles, a DJ until 1am, and so much more! If you’re wondering just how the event benefits our Veterans, though, here are the highlights: last year, Amanda and Coli were able to raise enough money to reserve a multi-passenger van for the Chippewa chapter. According to Rory Schutte (the prior manager of the DAV who has since retired), “Our vets are in need; the van will help us transport them to their appointments.” In particular, the DAV plans to use the van to take veterans to the VA hospitals in the Twin Cities and Tomah. So, come to support your veterans, to get some hair inspiration, or just for the shear fun of it (pun intended)! You can even use it as an opportunity to start collecting gifts for the upcoming holiday season—some of the items up for raffle include a wall of beer, a trip to Nashville, and more! Tickets are on sale at Ravin’ Manes, which is located at 3460 Mall Drive, Eau Claire. It is $50 for general admission and $75 for VIP tickets (i.e. runway seating and a swag bag). The ticket price includes admission into the event, a plated meal with your choice of pesto penne pasta or chicken cordon bleu, two drink tickets, and $25 directly to DAV Eau Claire Chapter. In regards to the event last year, Rory noted, “It was great; we had a great crowd. I’m excited about this year’s event and hope for a bigger audience.” If you’re interested in donating to, sponsoring, or buying tickets for Hairica, stop by Ravin’ Manes and ask for Amanda or Coli! Did you go to Hairica last year? Are you planning to go this year; if not, how are you spending your Veterans Day Weekend? Let us know in the comments section below!